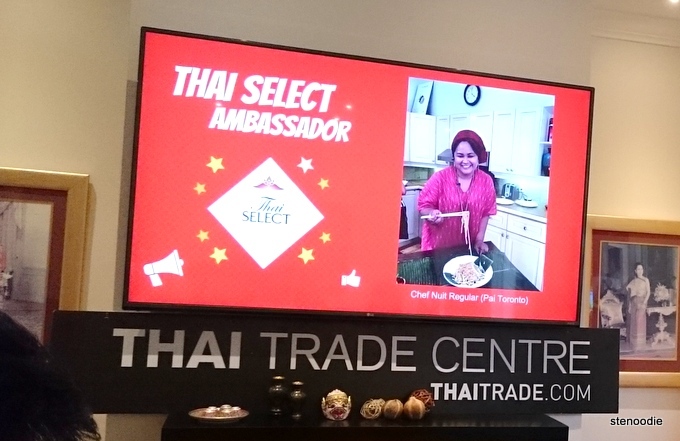 I had the pleasure to be invited to a tasty media preview of the upcoming Destination Thailand cultural food festival that will take place in Toronto on September 10, 2016 at the Yonge & Dundas Square in Toronto! 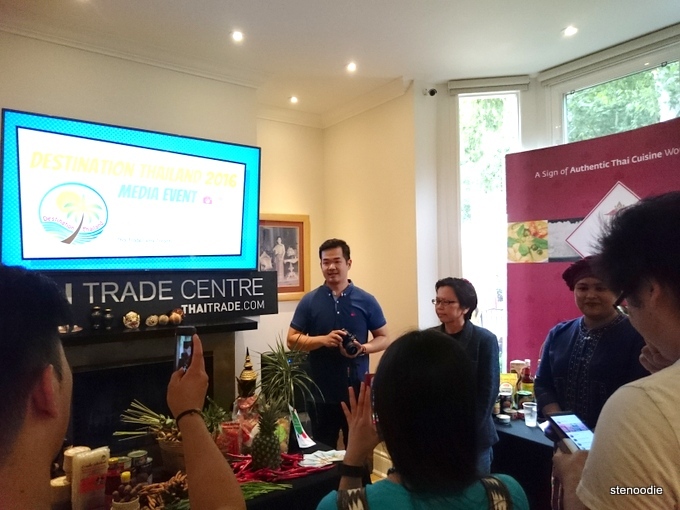 Thanks to Rey of EatnMingle events who organized and hosted the event, several members of the food blogger community and I were able to experience and taste the restaurants that are selected to represent the Thai food community at the Destination Thailand festival before anyone else. I was really excited for this event! 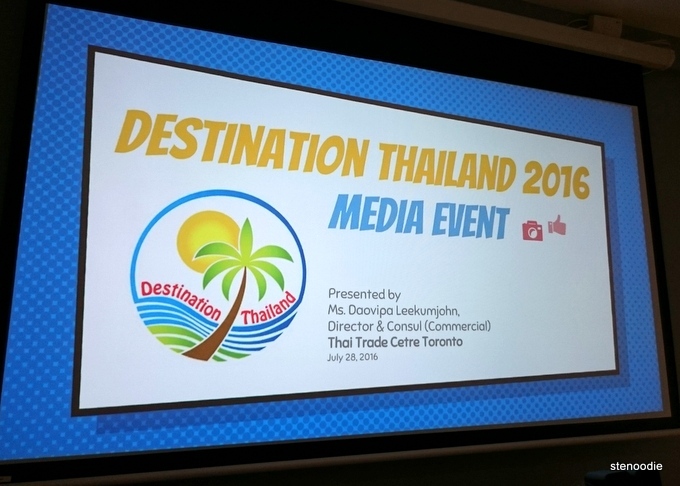 The media preview took place at the Thai Trade Centre at 31 Gloucester Street in Toronto. 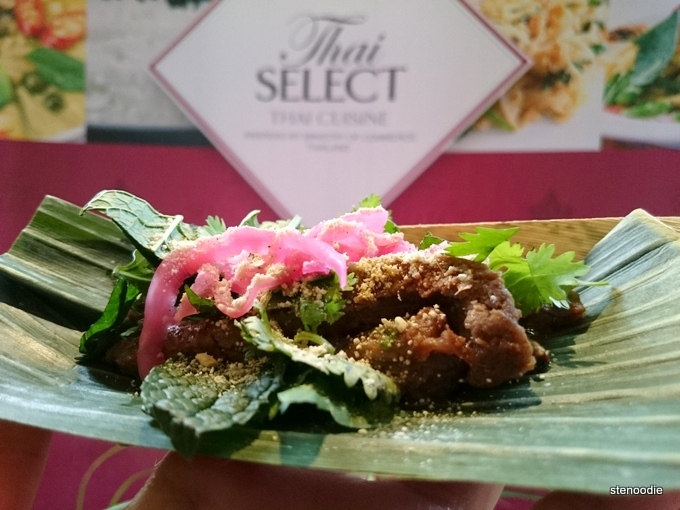 There were seven restaurants who were part of the Thai Select restaurants that would also be at the upcoming Destination Thailand festival. I learned something new! 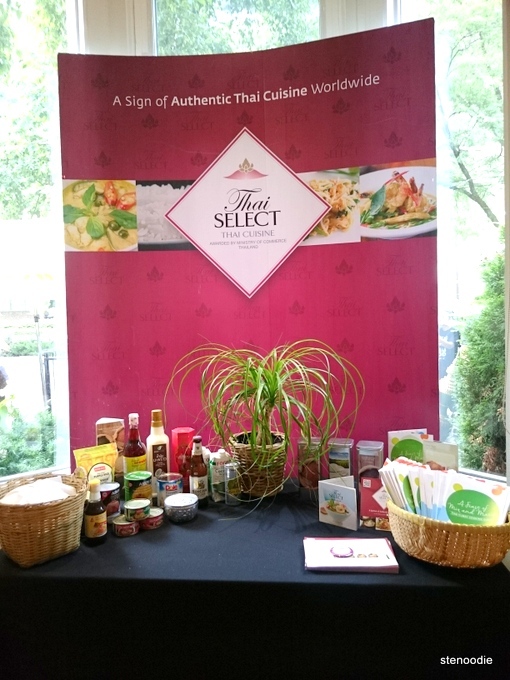 I wasn’t aware that there were Thai Select restaurants in Toronto. 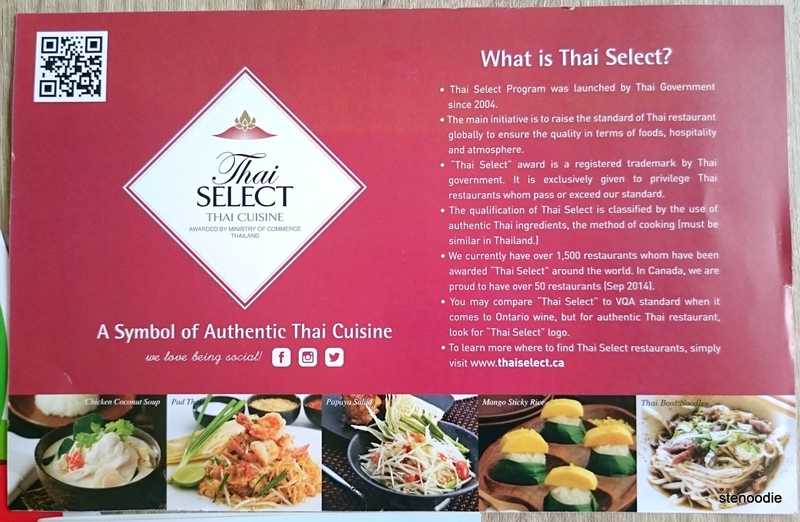 This is definitely something to keep an eye on as I attend Thai restaurants in the future as I do want to aim for the ones that are mostly authentic Thai. 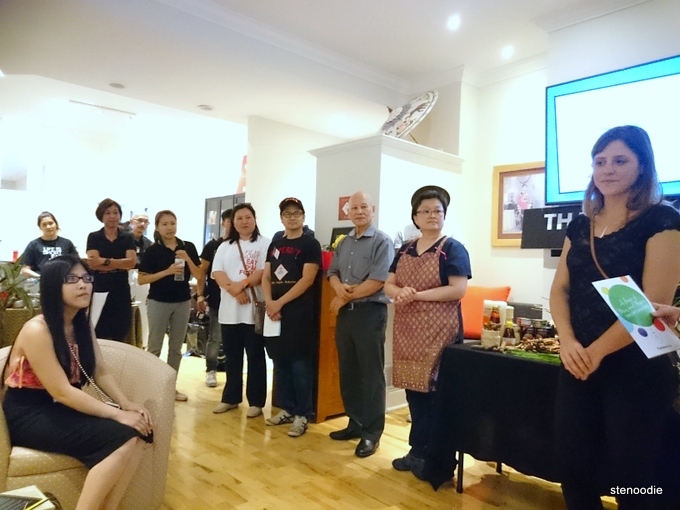 The event was set to begin at 5 p.m. on a Thursday evening. 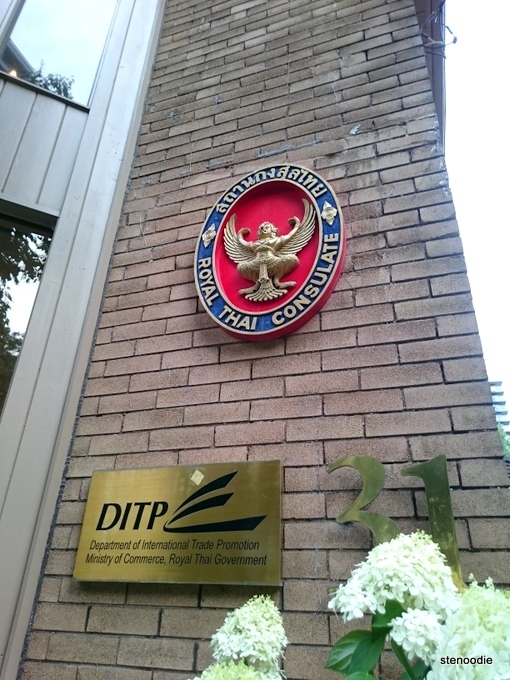 As I approached the Thai Trade Centre building, I noticed that the event was to be conducted partly outdoors and indoors! 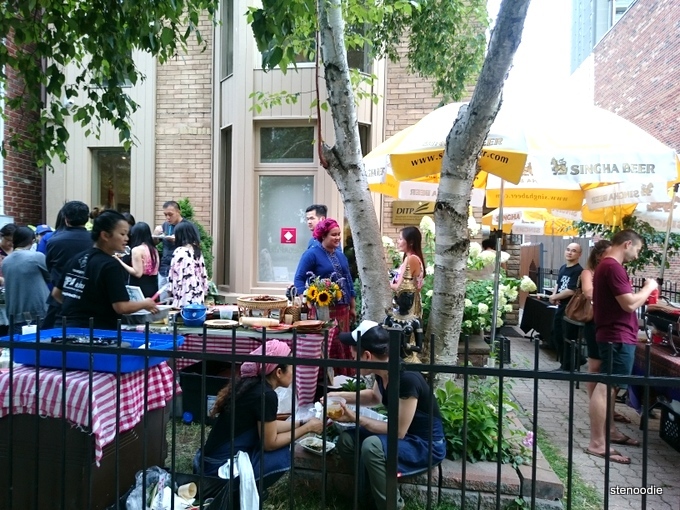 There were some restaurants set up with their booths outside in the yard while the presentation and mingling was going to be conducted indoors. 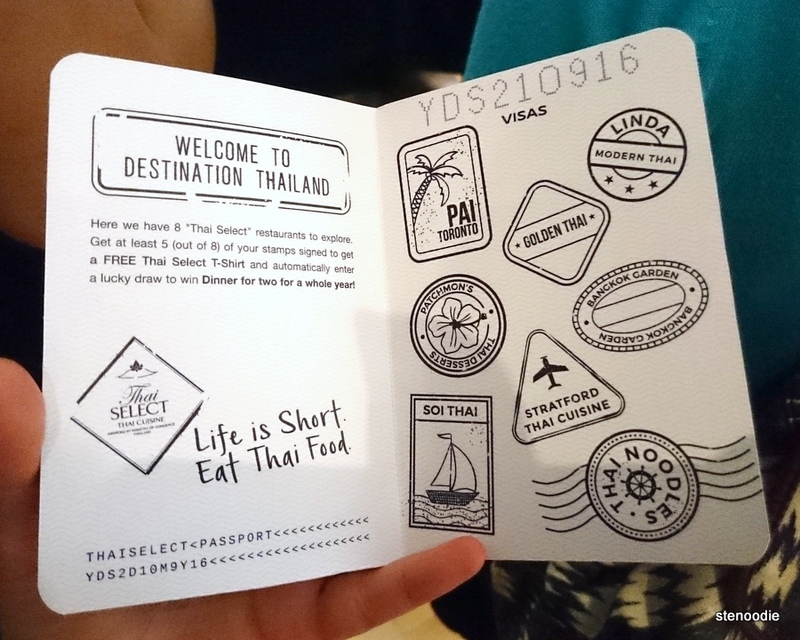 We got to see the fun “passport” that participants will receive at the Destination Thailand festival where they get to collect stamps from each vendor they visit. 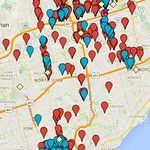 When they collect all the stamps, they can get a free T-shirt and apply to be part of a draw! 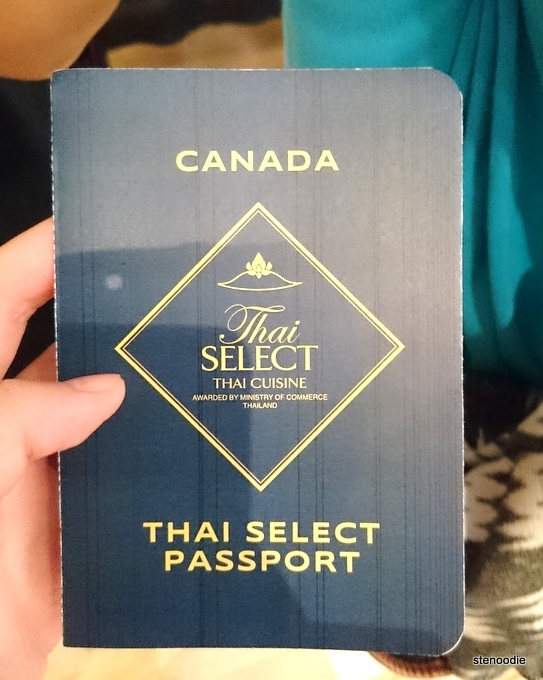 Thai Select Passport that will be handed out at the event for you to collect stamps from each food vendor! 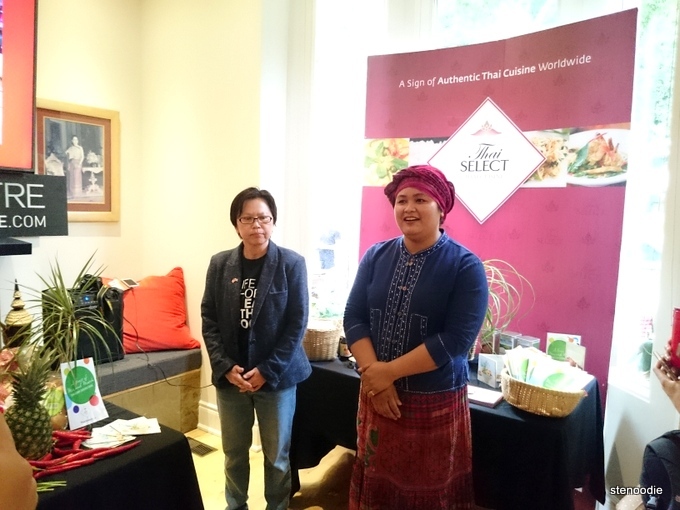 Nuit Regular as the Thai Select Ambassador! After the presentation, it was time to eat and mingle! 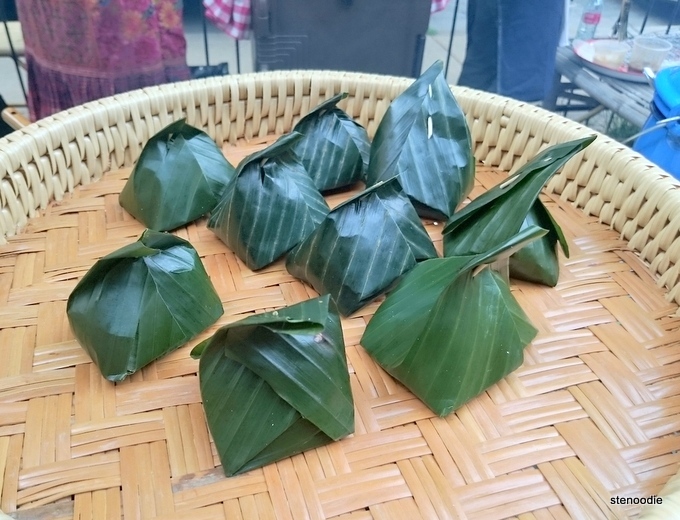 😛 We were free to roam around and taste food from each vendor in the order of our choice. Some of us went to the back of the house first while some of us started our Thai food journey at the front of the restaurant. 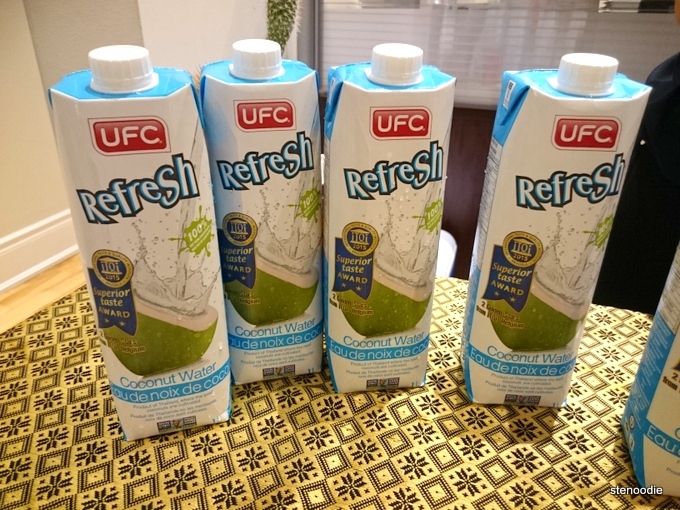 It was a really hot and humid day in Toronto so this coconut water really helped to refresh us as we started the event! 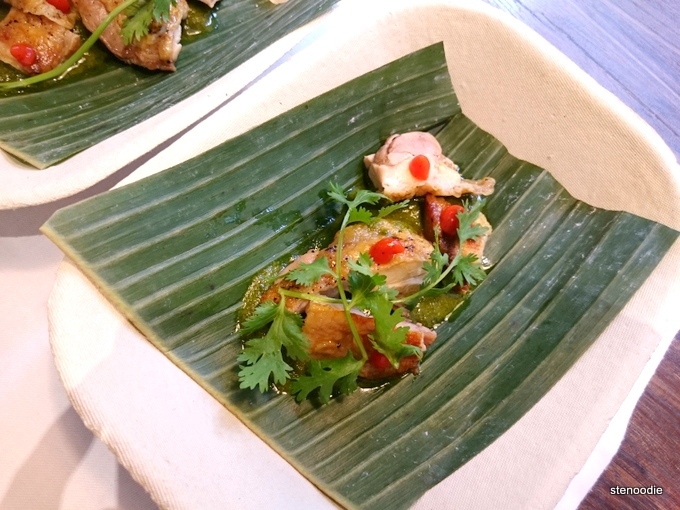 Out of all the restaurants that were present, I had only tried Pai Northern Kitchen before. 🙂 What an adventure it was that day to try so many dishes from new Thai restaurants that I never been to in the past! 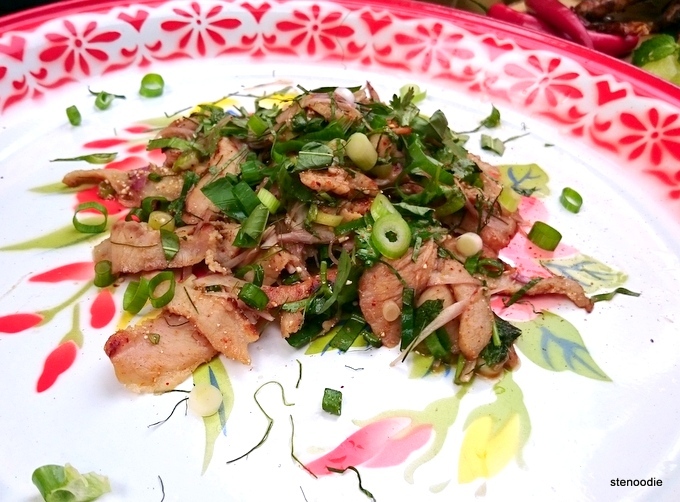 I tried the Toasted Cashew Chicken from Bangkok Garden first. 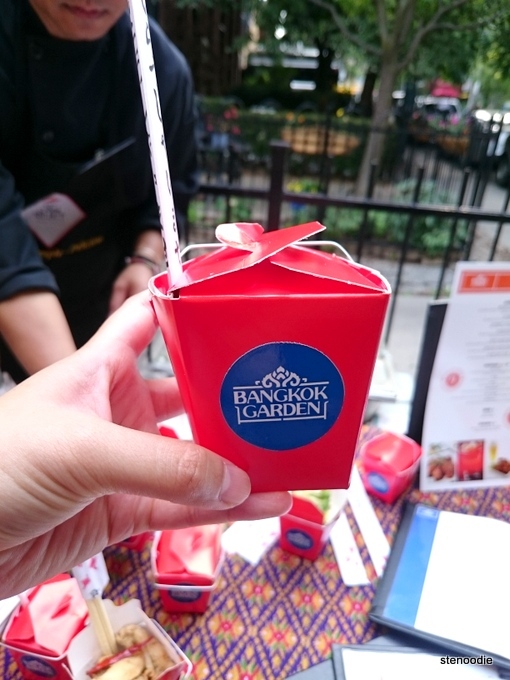 Their dish was presented in a little take-out box that I found extremely cute! 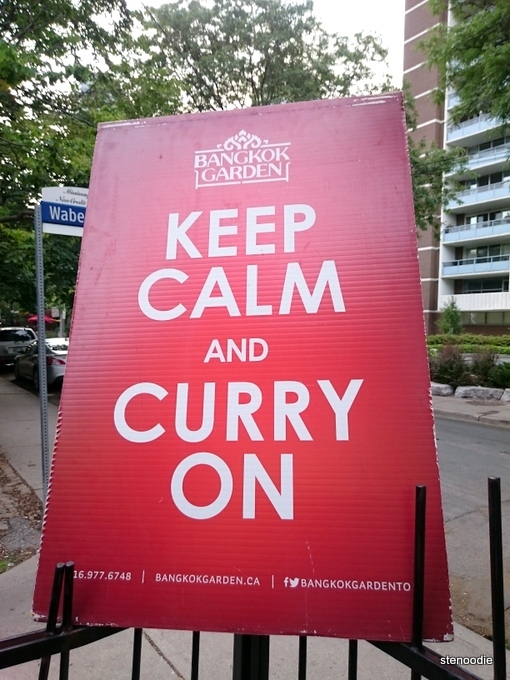 Bangkok Garden is located on Elm Street (near Elmwood Spa) and is in operation since 1982! 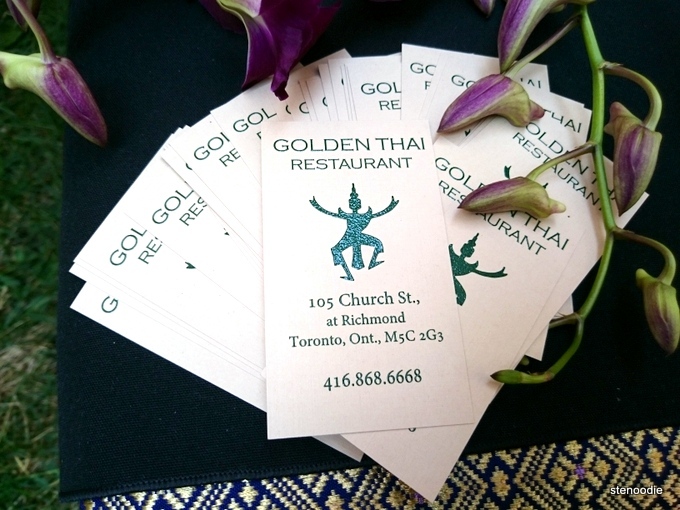 They are probably the oldest Thai restaurant in Toronto, if not the oldest! 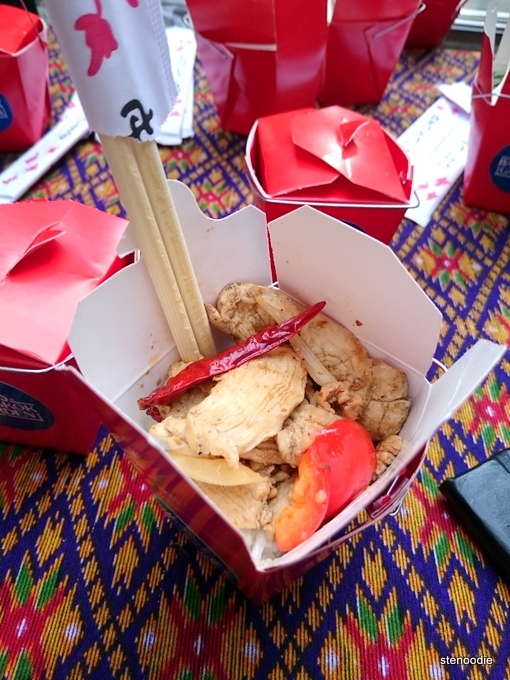 Pai Northern Kitchen was serving their Gai Ping chicken skewers. 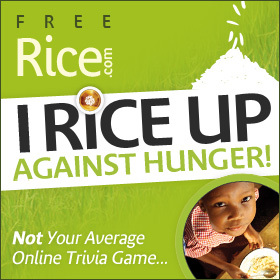 I actually had their chicken skewers before when I dined at their restaurant! (Blogged here.) 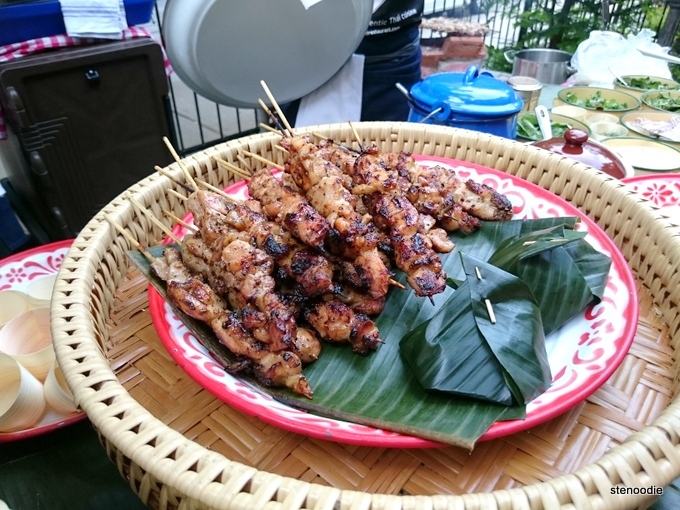 Their staff were grilling the chicken skewers right on open charcoal and it smelled delicious! 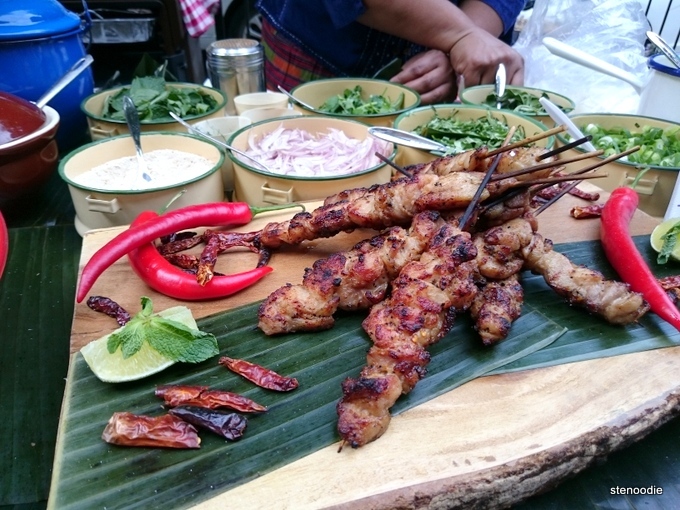 They expertly set up a platter of these chicken skewers, sticky rice (that was wrapped with banana leaves), and Moo Namh Tok (pork jowl) for us. 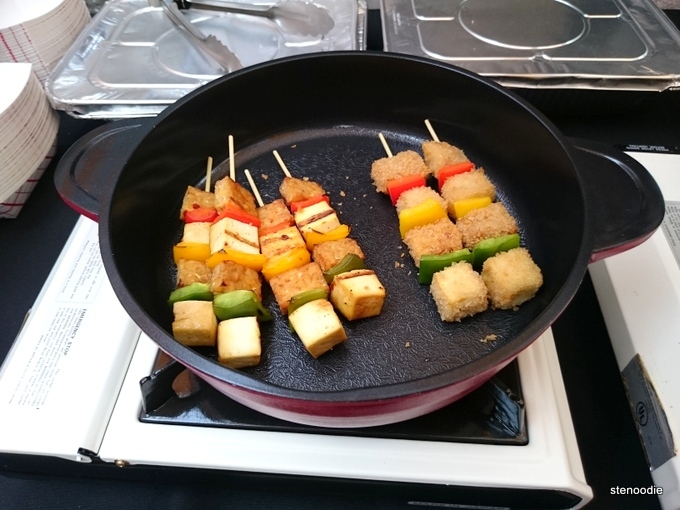 Live Gai Ping skewer grilling outside! 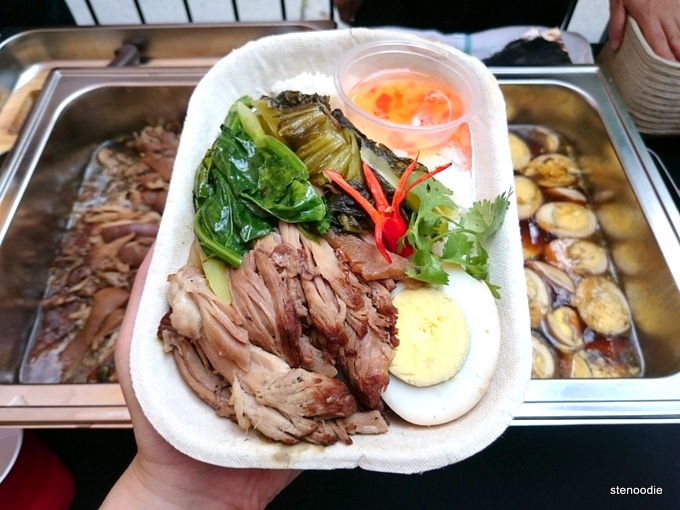 Moo Namh Tok freshly prepared as well! 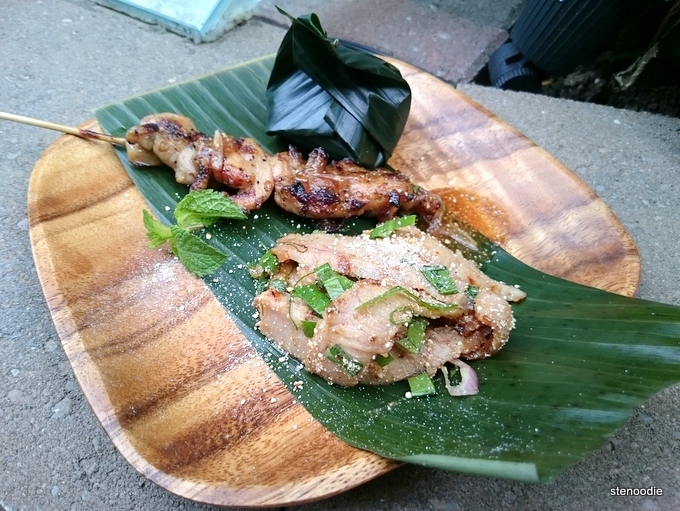 The Gai Ping chicken skewers were grilled chicken thigh with tamarind, fish sauce, lime juice, and roasted rice dipping sauce. 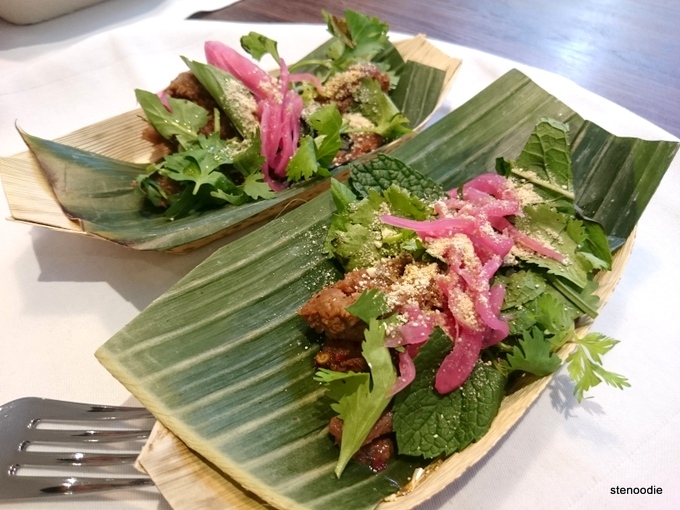 The Moo Namh Tok were Thai style grilled pork jowl in sour/spicy sauce. 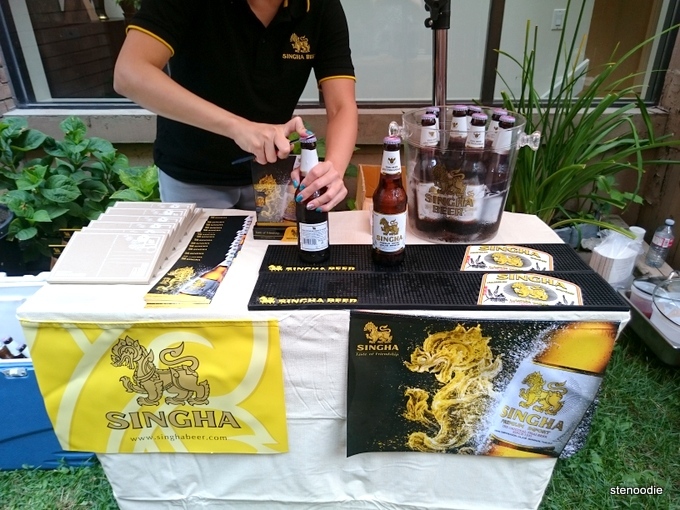 I enjoyed a nice cold beer from Singha Beer during the meal. I liked how the beer tasted light! 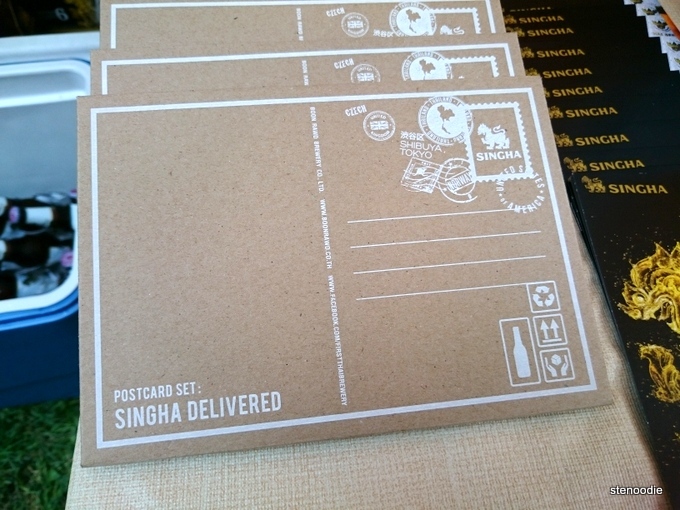 We were given these nice postcards from Singha Beer too! 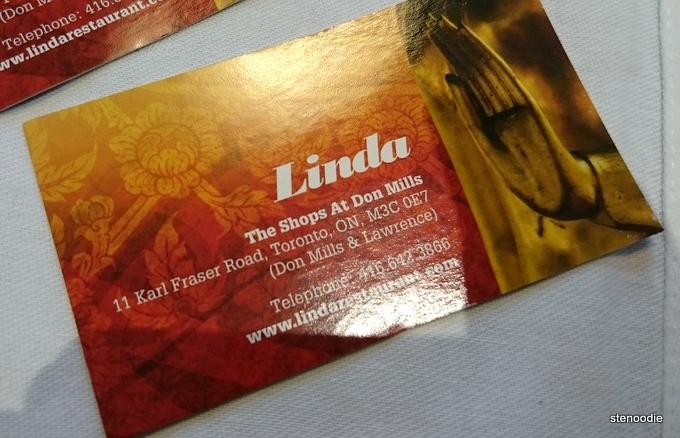 Linda Modern Thai was set up inside the kitchen area of the house. They served us beef salad and a lemon chicken dish (didn’t get the exact names of the dishes yet..). The presentation of these were so nice! 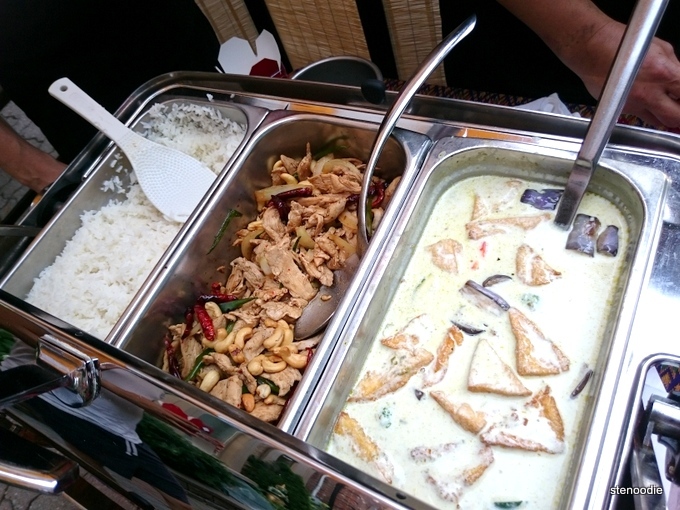 Golden Thai served us their new Golden Thai Tempeh & Tofu Satay as well as the Massaman Lamb Curry with Rice. 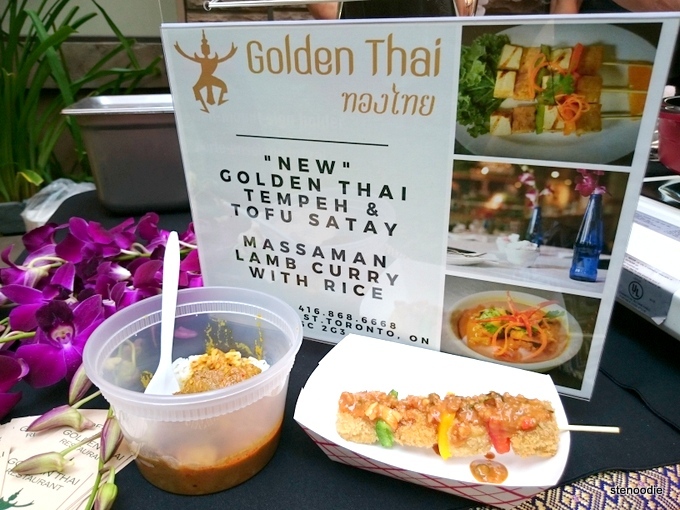 I was incredibly impressed with the Golden Thai Tempeh & Tofu Satay! 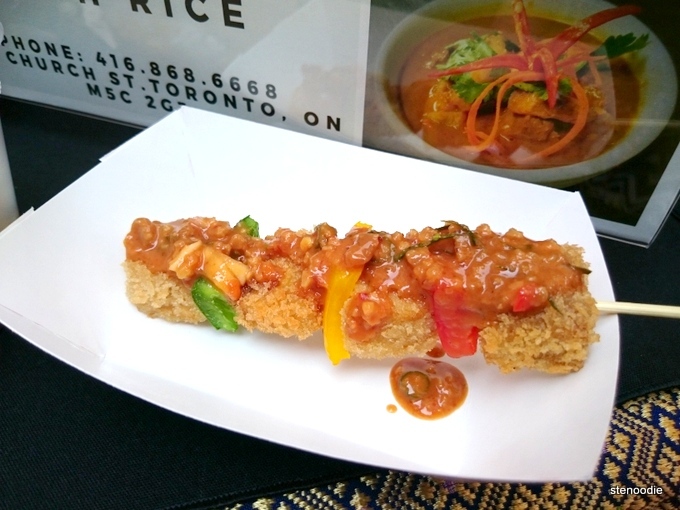 It was a skewer alternating between fresh peppers and breaded tempeh (they had a non-breaded version too) with satay peanut sauce drizzled on top of it. Wow, the breaded tempeh was delicious! The first time I had tempeh was in the comfort of my own home when I made it using a Fresh City Farms recipe. The way this tempeh was served was so moist and delicious. Yum! 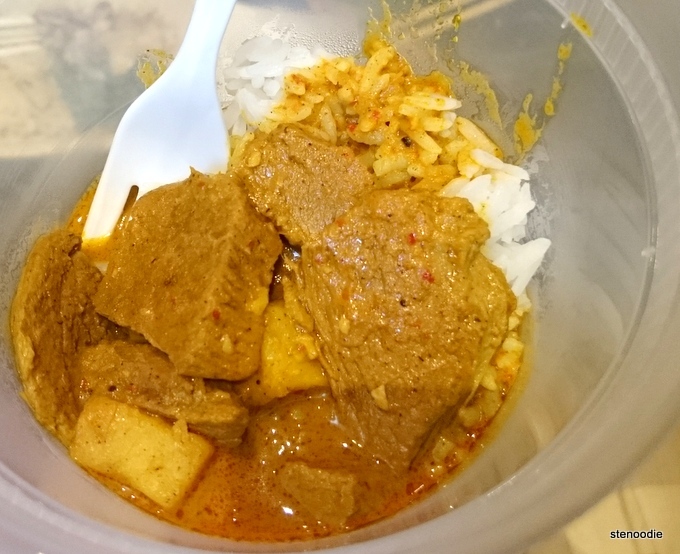 The Massaman Lamb Curry with Rice was also quite good and the curry wasn’t too spicy either. 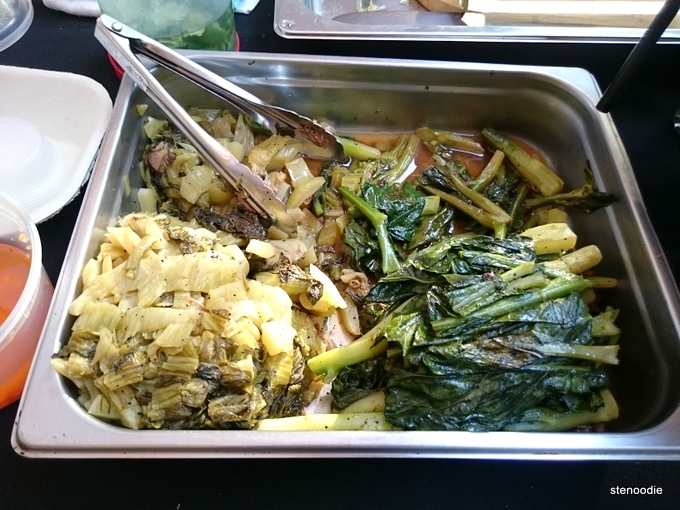 Soi Thai served us the Khao Kha Moo, pork hocks stewed in soy-based broth, spiced with star anise, cinnamon, cilantro root, garlic and white peppercorns, served over jasmine rice, with sides of blanced gai lan, pickled mustard greens, hard-boiled egg, and chili-vinegar sauce. 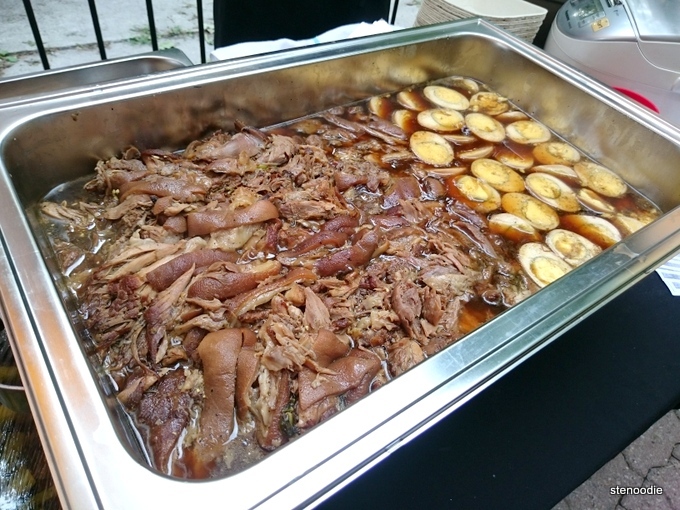 I really liked the chili-vinegar sauce that was quite spicy but went well with the pork hock and price. 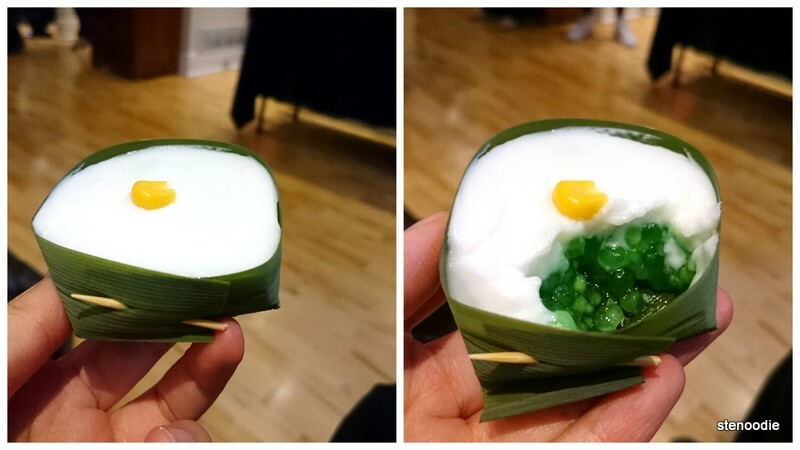 The hard-boiled egg was also really good since it was drenched with the soy-based broth. It was so good! 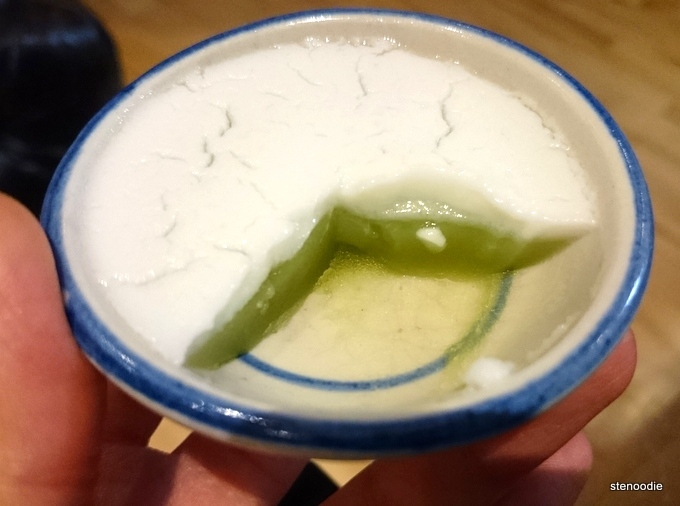 Before enjoying the Thai desserts, I went back to Bangkok Garden and tried their Vegetarian Emerald Curry. This was also packaged nicely in a little take-out box. 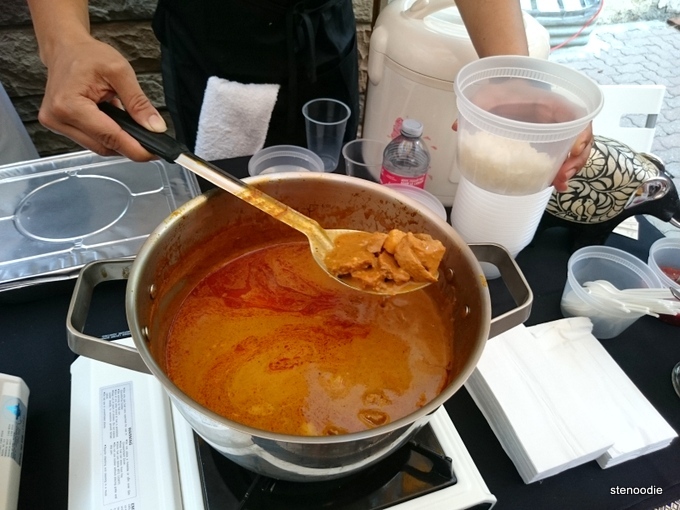 I was really surprised with how smooth their vegetarian curry was. 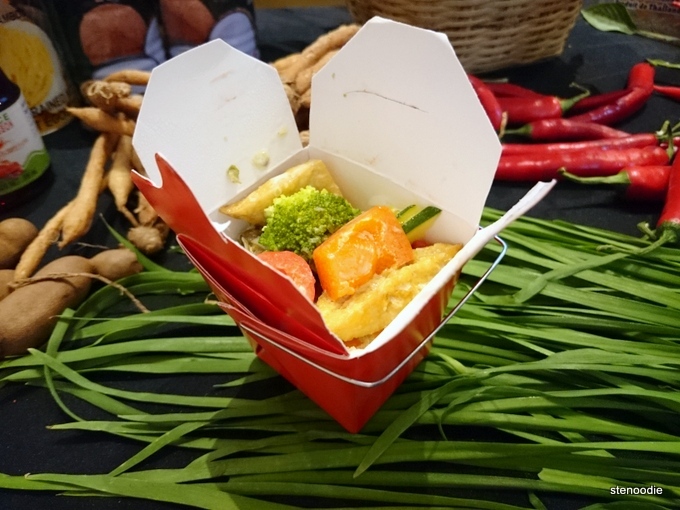 I liked the tofu in the box too and how it soaked up all of the curry. This was really good! 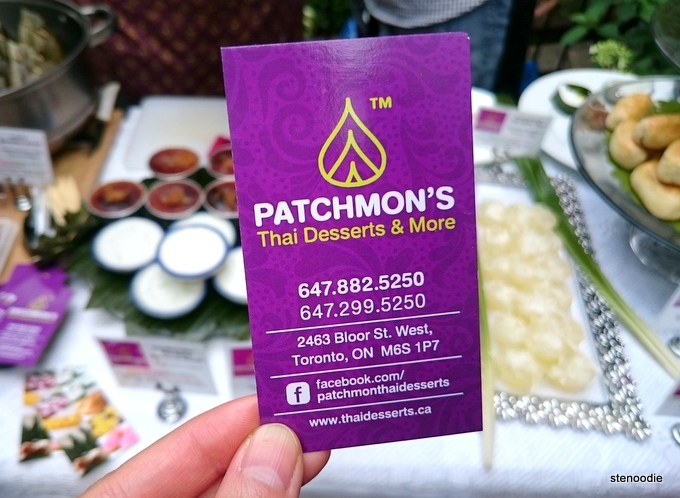 Last but not least, the final Thai Select food vendor was Patchmon’s Thai Desserts & More. 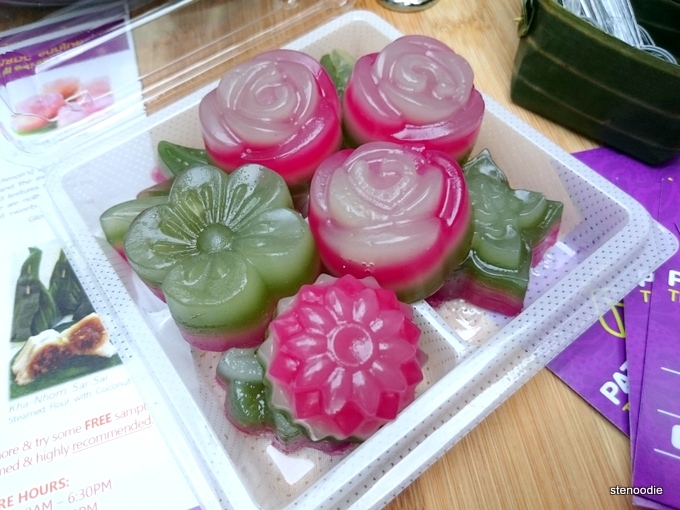 They were the only company in Toronto to offer authentic Thai desserts! 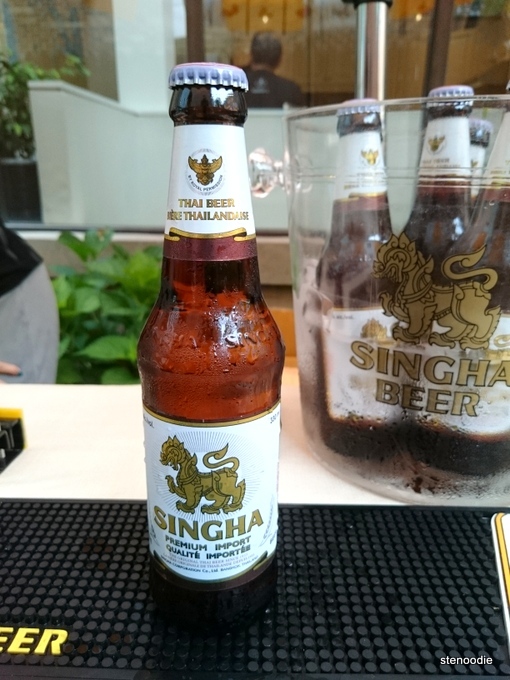 They said that all of their ingredients were imported straight from Thailand. Indeed, many of the desserts they served us that night were not to be seen in Toronto before. They had a beautiful set-up for us as well. We got to try a little bit of each dessert that they had which was genius. 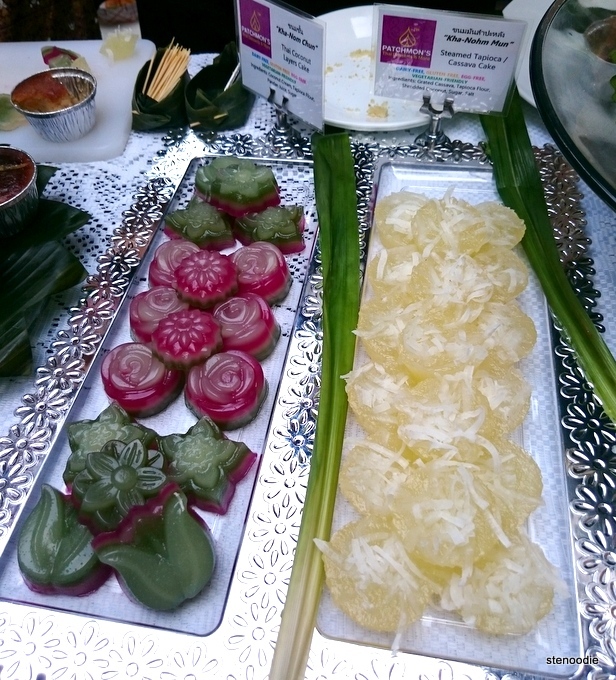 We tried the Pineapple Cookies, Flower-Shaped Cookies, Thai Spicy Pork Cookies, Sweet Tapioca with Coconut Cream, Rice Cracker Cake, Thai Taro Custard, Steamed Pandanus Cake, Thai Coconut Layers Cake, Steamed Tapioca/Cassava Cake, and Steamed Flower with Coconut Filling. Wow! This was absolutely incredible to try so many of their creations! 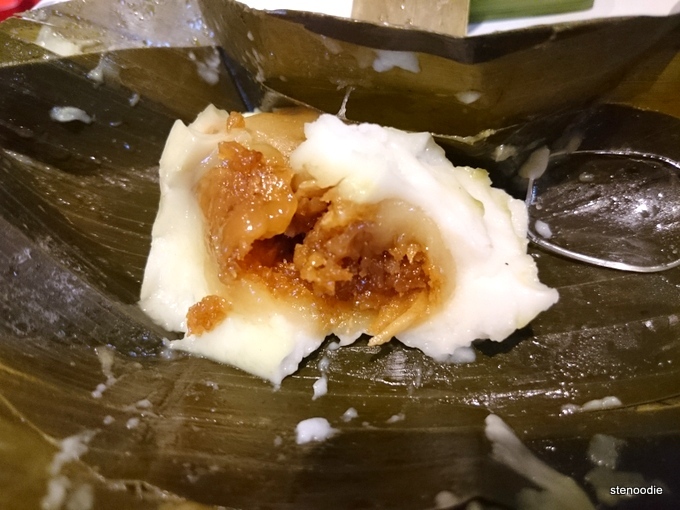 I really liked the Sweet Tapioca with Coconut Cream since the coconut cream on top was a little salty and definitely different from most sweet desserts. 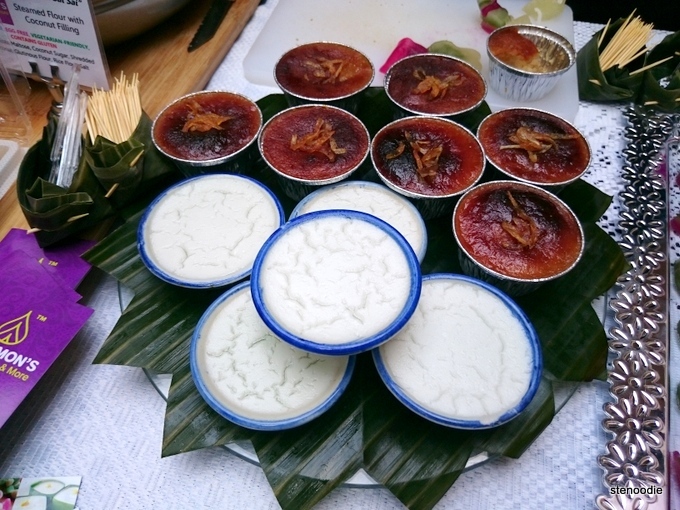 The Thai Coconut Layers Cake was unique because you could peel back each layer of the cake. 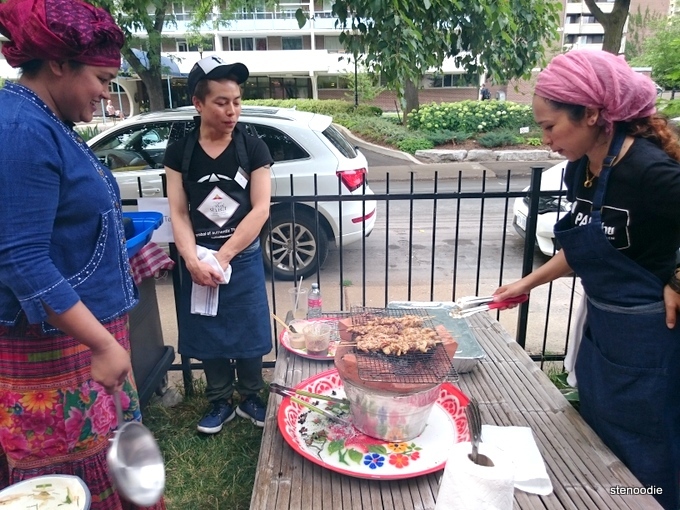 The owner explained that the cake signified a person’s development in life since we all have different layers. 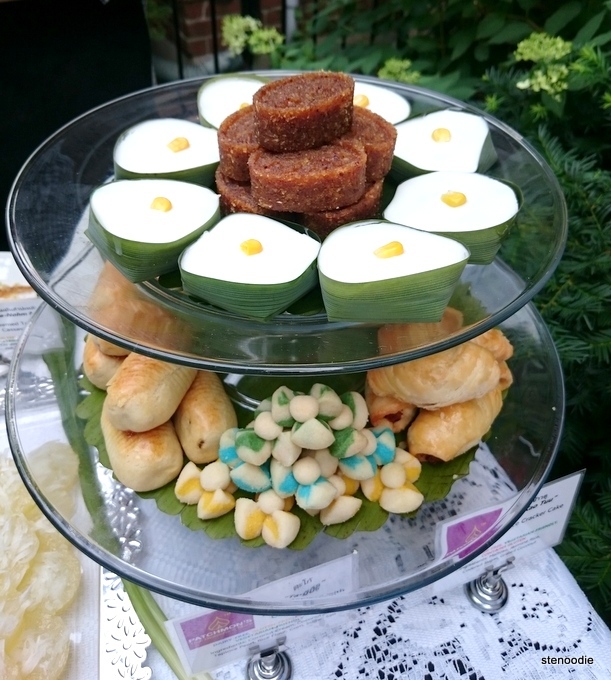 I also really liked the Thai Spicy Pork Cookies (so interesting to have pork in a cookie) and Steamed Pandanus Cake (similar to the Sweet Tapioca with Coconut Cream since the top was also a little salty due to the coconut cream). It was all so delectable! 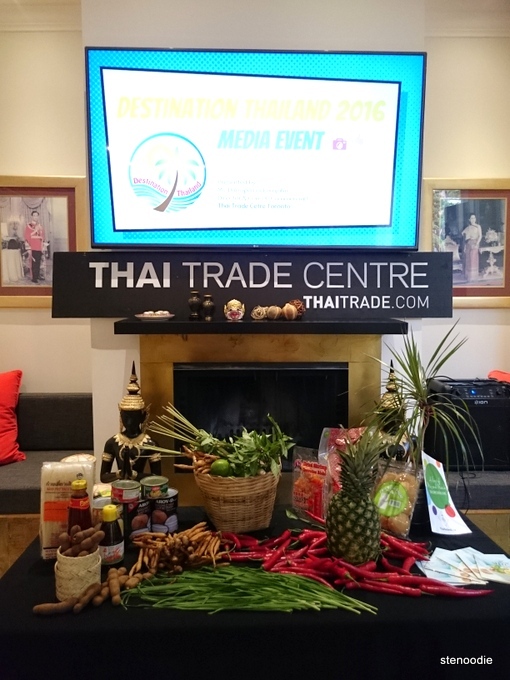 Alas, that was the end of our amazing and thorough tasting of the Destination Thailand festival that will be happening on September 10, 2016 in Toronto. 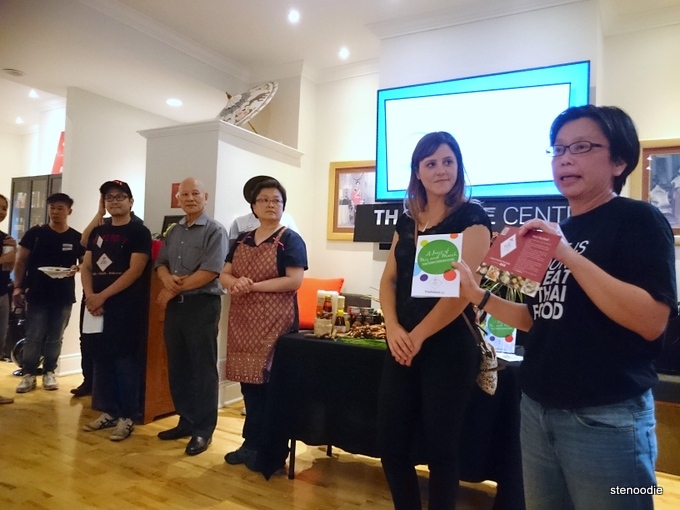 We had a final hurrah in the living room where we received a notice of thanks and appreciation from Rey and Oy, as well as a recognition of all of the participating restaurants and their owners and chefs. 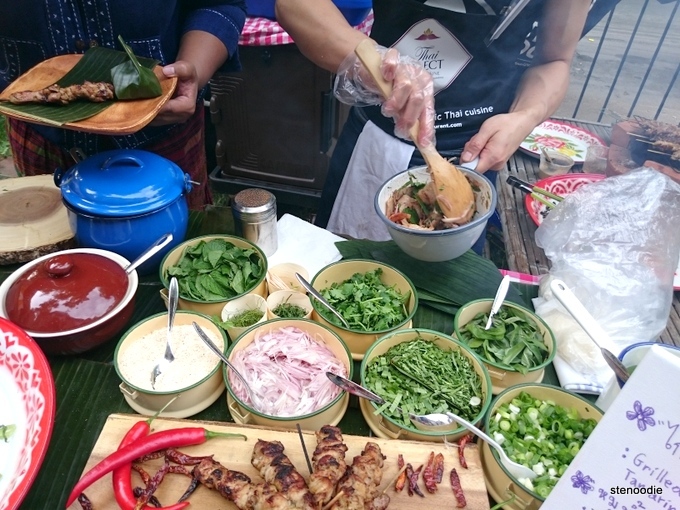 We were also gifted with a very generous goodie bag of ingredients and recipes in which we could create our own Thai dishes! 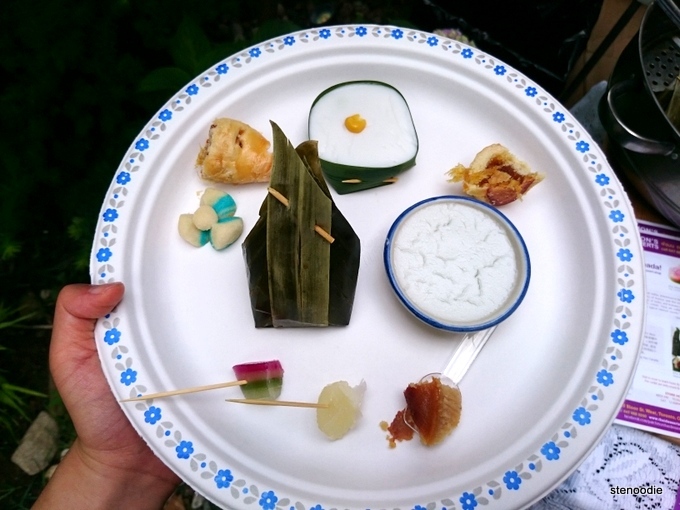 They gave us rice, rice noodles, fish sauce, palm sugar, green curry paste, and more! We each got a “Life is Short. 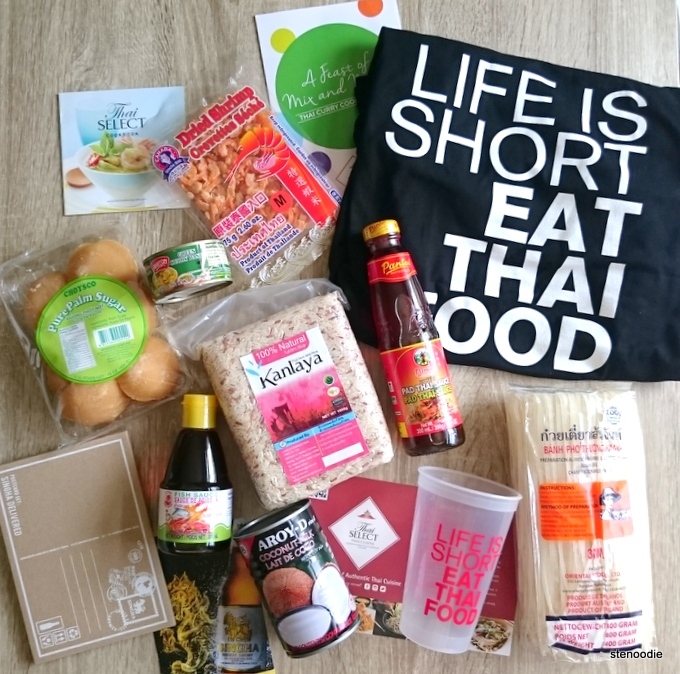 Eat Thai Food.” T-shirt too. 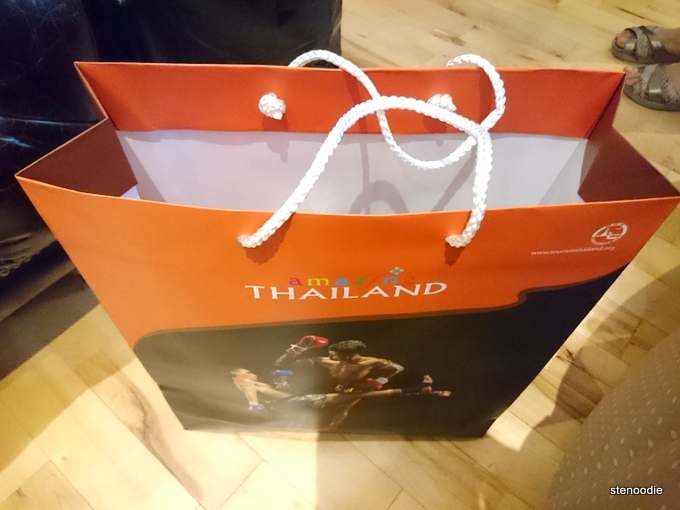 It was an amazing gesture from Thai Select and I am sure I speak for everyone when I express how grateful I was to be a part of this amazing media preview event. 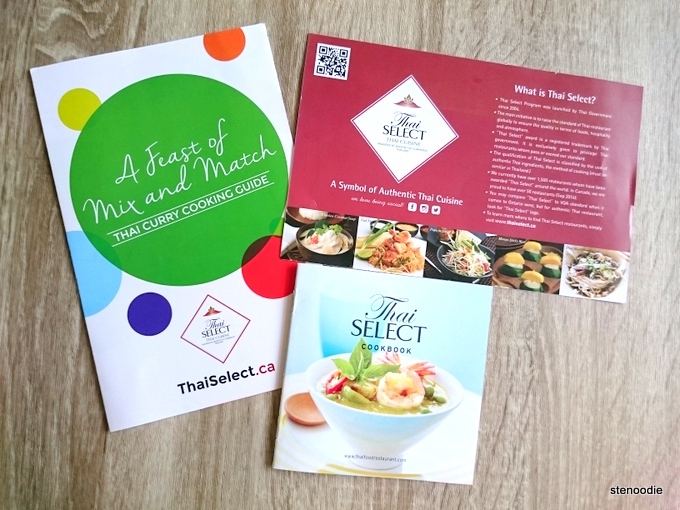 Thai recipes from these Thai Select cookbooks! 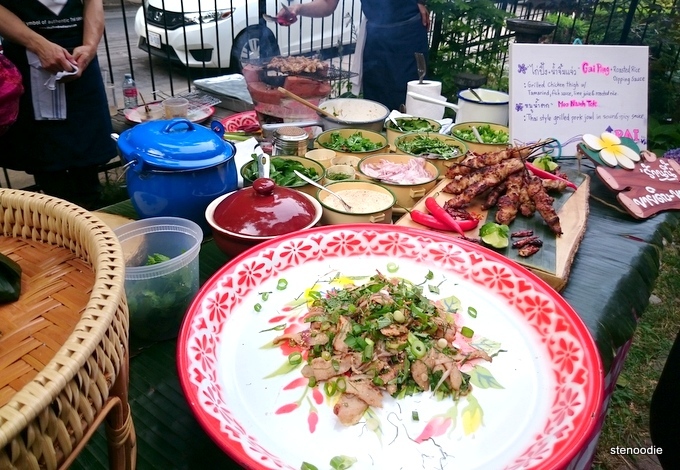 Amazing summer evening of feasting in Thailand! 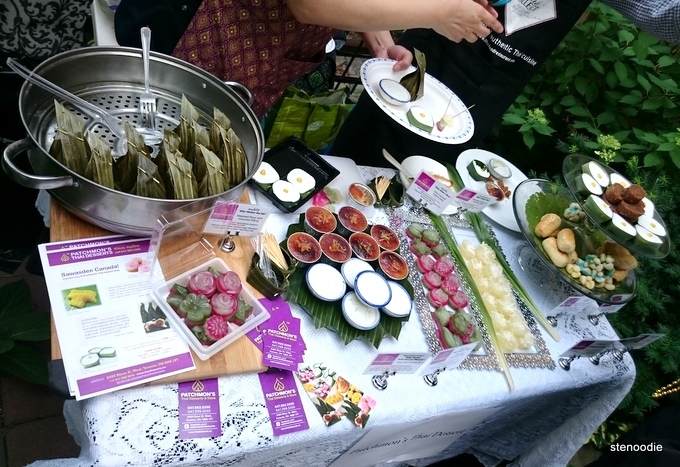 FTC Disclaimer: Although EatnMingle reached out and invited me to a complimentary tasting to showcase the food and vendors at Destination Thailand, the opinions expressed here represent my own and not those of the organizations. 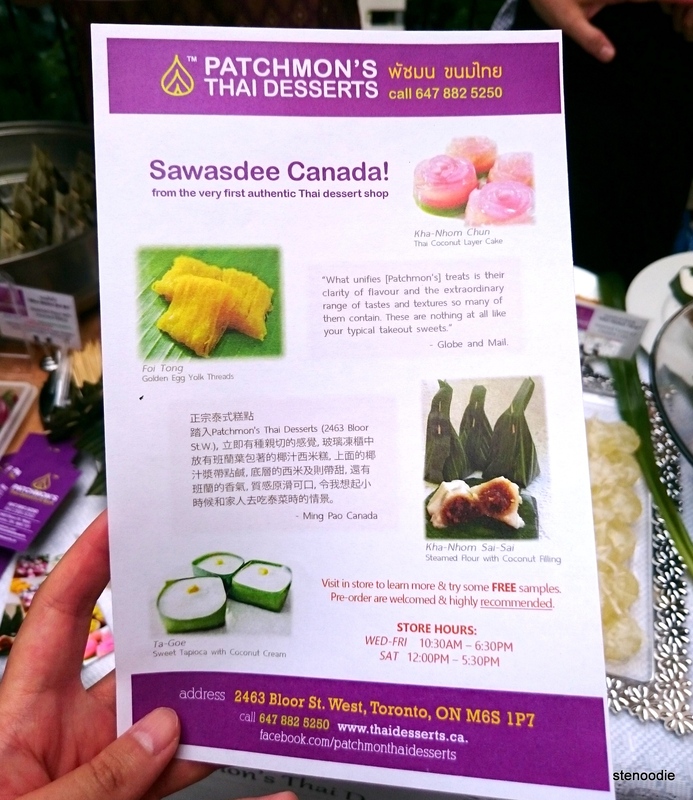 This entry was posted in Complimentary Adventures, Food and tagged assortment of Thai desserts from Patchmon's, Bangkok Garden, Destination Thailand, Destination Thailand 2016 passport, Destination Thailand media tasting 2016, food festivals, Linda Modern Thai, Moo Namh Tok, Pai Northern Kitchen, Patchmon's Thai Desserts, September 10 2016, Singha Beer, Soi Thai Toronto, Steamed Pandanus Cake, Thai, Thai festival in Toronto in September 2016, Thai food, Thai restaurants in Toronto, Thai Select, Thai Select restaurants, Toronto food festivals, Yonge & Dundas Square. Bookmark the permalink.